Let me set the stage by reading from a letter sent recently to Church headquarters. This woman wrote: I have a wonderful husband and children, whom I love deeply. I love the Lord and His Church more than I can say. I know the Church is true! I realize I shouldn’t feel discouraged about who I am. Yet I have been going through an identity crisis most of my life. I have never dared utter these feelings out loud but have hidden them behind the huge, confident smile I wear to Church every week. For years I have doubted if I had any value beyond my roles as a wife and mother. I have feared that men are that they might have joy, but that women are that they might be overlooked. I long to feel that I, as a woman, matter to the Lord. Today I would like to respond to the issue that underlies the concern of this faithful woman. Does the Lord respect women? Do women matter to the Lord? The answer is yes—a resounding yes! 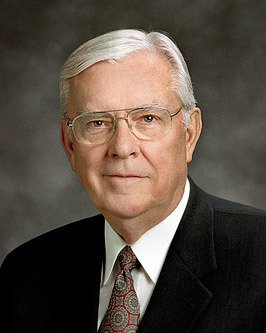 Elder James E. Talmage stated that “the world’s greatest champion of woman and womanhood is Jesus the Christ” I believe that. The first time the Lord acknowledged Himself to be the Christ, it was to a Samaritan woman at Jacob’s well. He taught her about living water and proclaimed, simply, “I . . . am he”. And it was Martha to whom He proclaimed: “I am the resurrection, and the life. . . . And whosoever liveth and believeth in me shall never die” Then, during His greatest agony as He hung on the cross, the Savior reached out to one person—His mother—when in that terrible but glorious moment He asked John the Beloved to care for her as though she were his own Of this you may be certain: The Lord especially loves righteous women—women who are not only faithful but filled with faith, women who are optimistic and cheerful because they know who they are and where they are going, women who are striving to live and serve as women of God. Our Heavenly Father endowed His sons and daughters with unique traits especially fitted for their individual responsibilities as they fulfill His plan. To follow His plan requires that you do those things He expects of you as a son or daughter, husband or wife. Those roles are different but entirely compatible. In the Lord’s plan, it takes two—a man and a woman—to form a whole. Indeed, a husband and wife are not two identical halves, but a wondrous, divinely determined combination of complementary capacities and characteristics. Marriage allows these different characteristics to come together in oneness—in unity—to bless a husband and wife, their children and grandchildren. For the greatest happiness and productivity in life, both husband and wife are needed. Their efforts interlock and are complementary. Each has individual traits that best fit the role the Lord has defined for happiness as a man or woman. When used as the Lord intends, those capacities allow a married couple to think, act, and rejoice as one—to face challenges together and overcome them as one, to grow in love and understanding, and through temple ordinances to be bound together as one whole, eternally. That is the plan. . . I obviously don’t know what it feels like to be a woman, but I do know what it is to love one with all of my heart and soul. I constantly express to the Lord overflowing gratitude for the unending blessings that flow to our children and so abundantly to me from the life of one of His precious daughters. I want the happiness we have found together to be yours. Sisters, your sphere of influence is a unique sphere—one that cannot be duplicated by men. 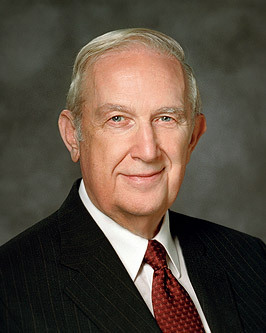 No one can defend our Savior with any more persuasion or power than you, the daughters of God, can—you who have such inner strength and conviction. The power of a converted woman’s voice is immeasurable, and the Church needs your voices now more than ever. “Be strong and of a good courage, fear not, nor be afraid . . . : for the Lord thy God, he it is that doth go with thee; he will not fail thee, nor forsake thee”. 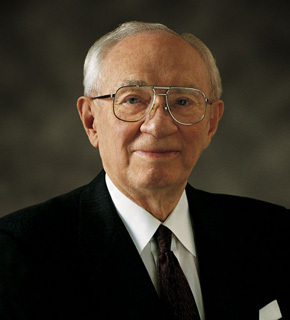 Take comfort in this counsel from Moses to Joshua as you let your voices be heard, for, as President Hinckley said: You cannot simply take for granted this cause, which is the cause of Christ. You cannot simply stand on the sidelines and watch the play between the forces of good and evi. . . You can be a leader. You must be a leader, as a member of this Church, in those causes for which this Church stands. Let us never forget that we are the sons and daughters of God, equal in His sight with differing responsibilities and capabilities assigned by Him and given access to His priesthood power as we make and keep sacred covenants and counsel together. Be careful that you continually strive to live and sustain the great plan of happiness that is our Father’s revealed plan of salvation for His sons and His daughters. 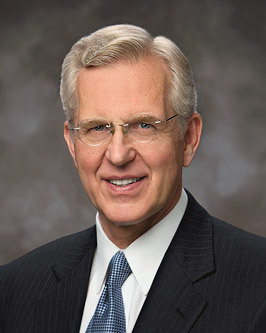 Surely we will be able to think straight if we stay focused on God’s eternal plan and doctrine and use our strength in reaching out and helping others to do the same as we share our testimonies and our knowledge of the basic and simple message of the Restoration of the fulness of the gospel of Jesus Christ. A woman’s moral influence is nowhere more powerfully felt or more beneficially employed than in the home. There is no better setting for rearing the rising generation than the traditional family, where a father and a mother work in harmony to provide for, teach, and nurture their children. Where this ideal does not exist, people strive to duplicate its benefits as best they can in their particular circumstances. In all events, a mother can exert an influence unequaled by any other person in any other relationship. By the power of her example and teaching, her sons learn to respect womanhood and to incorporate discipline and high moral standards in their own lives. Her daughters learn to cultivate their own virtue and to stand up for what is right, again and again, however unpopular. . . Most sacred is a woman’s role in the creation of life. We know that our physical bodies have a divine origin and that we must experience both a physical birth and a spiritual rebirth to reach the highest realms in God’s celestial kingdom. Thus, women play an integral part (sometimes at the risk of their own lives) in God’s work and glory “to bring to pass the immortality and eternal life of man.” As grandmothers, mothers, and role models, women have been the guardians of the wellspring of life, teaching each generation the importance of sexual purity—of chastity before marriage and fidelity within marriage. In this way, they have been a civilizing influence in society; they have brought out the best in men; they have perpetuated wholesome environments in which to raise secure and healthy children. I thanked him, and when I left him I said to myself, shaking my head: “You never know. You never know whether you do any good. You never know how much good you do.” Now, my dear sisters, that is the way with you. You are doing the best you can, and that best results in good to yourself and to others. Do not nag yourself with a sense of failure. Get on your knees and ask for the blessings of the Lord; then stand on your feet and do what you are asked to do. Then leave the matter in the hands of the Lord. You will discover that you have accomplished something beyond price. Now, we have a very diverse group to whom I am speaking. This includes young women who are still in school or who are working. You are single. You are hoping to catch that perfect man. I have yet to see one who is perfect. Aim high, but do not aim so high that you totally miss the target. What really matters is that he will love you, that he will respect you, that he will honor you, that he will be absolutely true to you, that he will give you freedom of expression and let you fly in the development of your own talents. He is not going to be perfect, but if he is kind and thoughtful, if he knows how to work and earn a living, if he is honest and full of faith, the chances are that you will not go wrong, that you will be immensely happy. First let me say to you sisters that you do not hold a second place in our Father’s plan for the eternal happiness and well-being of His children. You are an absolutely essential part of that plan. Without you the plan could not function. Without you the entire program would be frustrated. As I have said before from this pulpit, when the process of creation occurred, Jehovah, the Creator, under instruction from His Father, first divided the light from the darkness and then separated the land from the waters. There followed the creation of plant life, followed by the creation of animal life. Then came the creation of man, and culminating that act of divinity came the crowning act, the creation of woman. Each of you is a daughter of God, endowed with a divine birthright. You need no defense of that position. 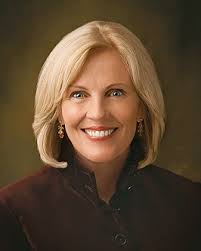 . . What a resource are the women of The Church of Jesus Christ of Latter-day Saints. You love this Church, you accept its doctrine, you honor your place in its organization, you bring luster and strength and beauty to its congregations. How thankful we are to you. How much you are loved, respected, and honored. I salute my own beloved companion. It will soon be 60 years that we walked from the Salt Lake Temple as husband and wife, with love for one another. That love has strengthened through all of these years. We have faced many problems during our years of marriage. Somehow, with the blessing of the Lord, we have survived them all.